It’s no secret that our customers are at the core of everything we do—whether it’s finding prospects, developing an initial relationship, and, arguably most importantly, after the deal is done. So how does our sales team get to know our customers? We’re asking the team directly. In tribute to our favorite customer-centric sales people, we’re talking to industry team members who are doing customer relationships right. We’re kicking off our campaign with Tim Brown, chief business information officer who has been in the healthcare sector for majority of his career. Healthcare, is about partnering and delivering value with customers, finding out where they’re at in their journey,” Brown says. He believes relationships should be thought of as “mutually beneficial partnerships” where both bring their perspectives and insights to the table and work towards a common goal. At the executive level, day-to-day schedules are often filled with handling the more strategic direction of the company, and there is only limited time for meetings. This time, Brown says, is extremely valuable—and must be done in a personal, individualized way. So, how does Brown get to know a customer at the initial stages? Believe it or not, his preference is not a phone call or LinkedIn message. It’s the old-fashioned way: offline. For the ongoing relationship, developing cadence is key. Ultimately it comes down to understanding your customer and finding the value for both parties. What insights do you bring to the table? How does the customer like to communicate and engage? Developing the symbiotic relationship, where both customer and company learn and grow together, takes time and requires deep industry knowledge. Ultimately, however, it ensures goals are reached, and everybody is happy. 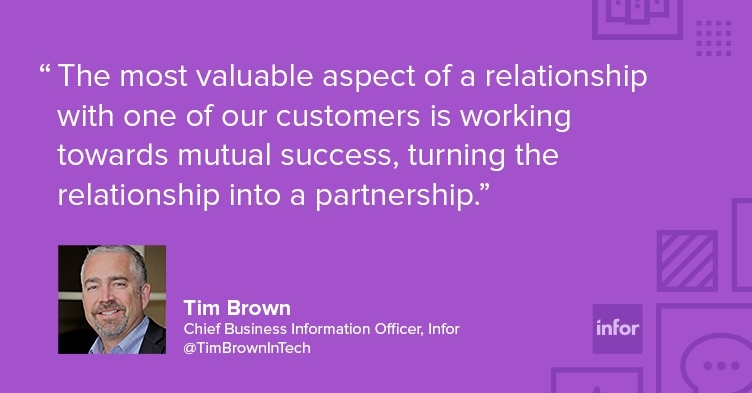 Infor’s products are developed for next-mile functionality, and it’s apparent that our sales team members are dedicated to their customers, and determined to go the additional mile for them. Meet other Infor sales stars in our quarterly Get to Know Your Customers Day series.